In the past few years, we've seen numerous popular bands get back together and tour after breaking up years earlier. While I loved seeing a group like Guided by Voices again, the general trend is getting a bit ridiculous. A band like The Who has been playing farewell tours since the early '80s! On the other hand, there's James Murphy of LCD Soundsystem. They've continued to build a larger following with each album since the first singles in 2002. In February 2011, Murphy posted a statement on their website that the show at Madison Square Garden on April 2 would be their last. It was a stunning move by the 41-year-old who was ready to quit the life of touring. While his choice is admirable, it also raises questions about why he'd step away from the game at the height of the band's popularity. I'm hardly an expert on LCD Soundsystem and really only got into them after the release of their 2010 studio album This is Happening. In a strange way, their final concert was an introduction to Murphy and the band right as they're leaving the spotlight. 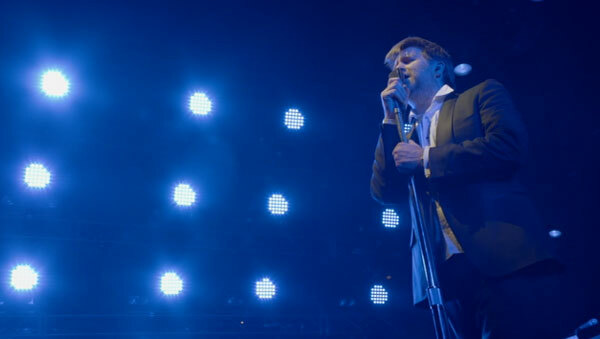 This film chronicles the final concert for LCD Soundsystem at Madison Square Garden. The long show lasts more than four hours and includes special guests like The Arcade Fire. There are plenty of excellent songs presented, but that's only part of the story. We spend time with Murphy before and after the big night to learn why he decided to stop the band. Chuck Klosterman interviews him a week earlier and tries to delve into the issues, but here's no easy answer. We also join Murphy the day after the show as he tries to figure out the next steps. It's a nearly silent change from the party that lasted well into the night. Although it's primarily a concert film, the tone feels different because the directors are clearly interested in discovering why Murphy would stop the band. The performances are magnetic, and they present a sharp contrast with the quiet moments before and after the show. Murphy stands in his empty offices and seems ready to cry if he thinks too much what he's set aside. Logically, the decision makes sense when you consider the physical and emotional toll of touring. On the other hand, it's difficult to give up something that he obviously loves. He's built a devoted following for LCD Soundsystem, and their success is very rare. Even when Murphy goes through his legitimate reasons for stopping, there are clear doubts visible on his face that he wonders inside if it might be a terrible decision. This question isn't as suitable for a concert film, but it fits when you consider Murphy and the band. Looking first at the supporting players, we don't get to know much about them beyond a few quick lines. Even so, they have an interesting dynamic offstage while saying little. It's clear that they've spent a lot of time together and have a close bond. The most engaging on-stage performer is Nancy Whang, who plays keyboards and sings. She's front and center right behind Murphy and plays a big role in their stage presence. 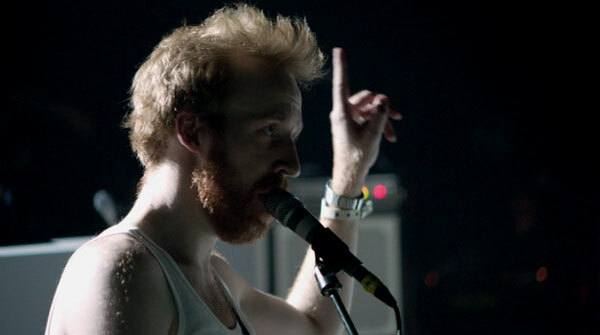 The other energetic force is Al Doyle, who brings the power to the show. They're a cool group but never feel aloof from the audience, which isn't an easy combination to have on stage. It's impossible to list one highlight in a show filled with them. The performance of "North American Scum" with members of The Arcade Fire singing back-up is a classic moment. Win Butler throws out the movie's title right before the rousing number. Comedian Reggie Watts (Comedy Bang Bang) also appears and shows off quite a melodic singing voice during another tune. My favorites include the powerful rendition of Murphy's first single "Losing My Edge" and the sing-along "Us vs. Them", which gets everyone dancing into a frenzy. The show ends on a somber note with "New York, I Love Your But You're Bringing Me Down". While fans mourn about the loss (the camera catches one particularly upset young guy), others are clearly blown away by the incredible show. It takes a special level of devotion from fans to generate this type of reaction after a farewell show. There have been so many concert films that take us behind the scenes, so it's easy to think that it's impossible to be original. That isn't the case here. Directors Will Lovelace and Dylan Southern make the performances electric without using standard tropes. Employing talented individuals like Spike Jonze as camera operators doesn't hurt. We get the "you are there" feeling of being in the audience and sharing the communal experience of the last show. This contrasts sharply with the bright, yet eerily quiet feeling of the other scenes. Away from the stage, they create a clear feeling that something wonderful has been lost. There are many future possibilities, but will anything compare to this ultimate concert? That question won't be answered for a long time, but it hangs over everything in this film. Looking ahead, does this movie have a chance at making my Top 10 List? I had a blast watching this movie, so there's a chance it will slide into the back of the top 10. This depends on the strength of the next few months. If the big art-house films match the high expectations, they may push Shut Up and Play the Hits out of the group. Even so, this is a great concert film with excellent performances and interesting background footage. We learn about Murphy's life away from the crowds and then get an up-close look at just how damn good they are. While LCD Soundsystem is over, I expect this isn't the last that we've heard from James Murphy. 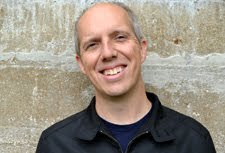 He wrote the score for Greenberg back in 2009, so it's possible he'll head into that realm. His future is wide open, and I'm still discovering how much amazing music he's put out in the past 10 years. Next week, I'll join Paul Dano once again as he creates Zoe Kazan in Ruby Sparks.